After I finished my post this morning I was able to finish Matthews vinyl wall project and I'm super happy with how it turned out! I wanted to stay with the superhero theme in his bedroom, so I did his name and then I made a silouhette out of a photo I took of him in a superhero cape last summer. I think I probably showed that photo here several months ago. I just did some tricky Photoshop work on it to make the silouhette and then I cut it with my vinyl cutter. It's super fun and Matthew loves it! We've finally reached the end of a really long and difficult week and things are starting to look up around here! Josh got his hard cast on Friday morning. 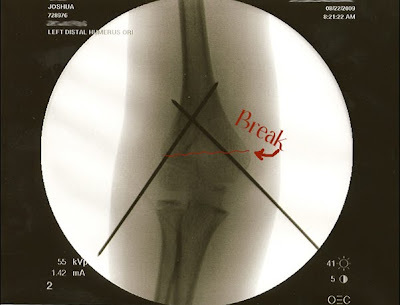 It was a painful appointment because they had to do more x-rays and it's still hard for him to move his arm too much, but he got through it. They let him pick the color for his cast and he couldn't decide between blue and green, so they did it in blue and green stripes, which he's thrilled with. 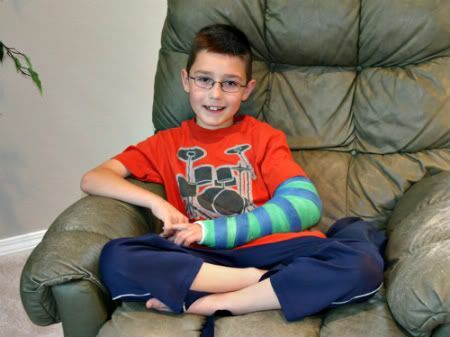 Casts are much more fun than they used to be when we were little, aren't they? There were no fun colors when we were growing up! Anyway, he seems a lot happier with his new cast because it's lighter and easier for him to get around in, so I think life is going to get a little easier around here. 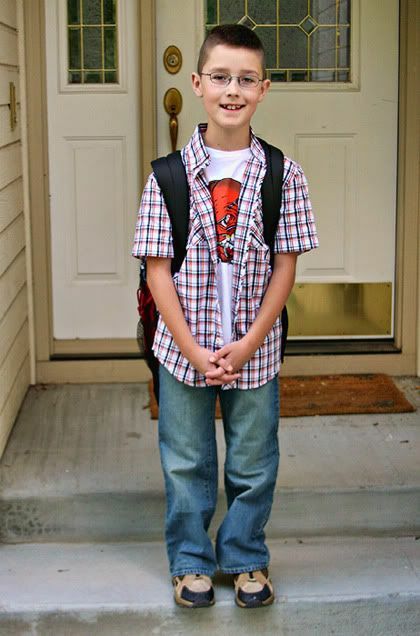 He's can go back to school on Monday, which he's looking forward to. So now that things aren't quite so crazy around here, I'm back to working on some Clarissa projects. I've been trying to decide how to decorate the walls in Clarissa's room for quite a while and I've had a really hard time making up my mind. I've had some ideas about vinyl lettering, but what I wanted to do was really specific and I finally decided that rather than find someone who could do it for me, I would just buy the machine and do it myself! I love vinyl wall letters and there are a whole bunch of projects that I want to do in my house with them. I've gone back and forth about buying the machine for a while and yesterday morning I decided that it was time to just go buy it. So yesterday I pretty much spent the whole day learning how to use it and designing my very first project! I did Clarissa's name above her bed, and then below that I did her Korean and American names in Korean. It's not quite done yet, because I'm still going to add a little design in between the Korean words, but I took a picture of it to share anyway. I'll take another picture when I decide which design I'm going to use in the middle. pardon the crappy picture. I'm going to take better ones when I get the whole room done. So now I'm all excited to start labeling everything in the house with vinyl letters. 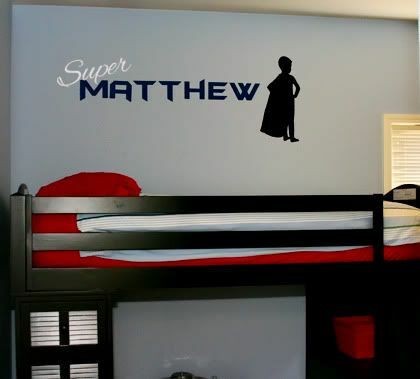 :) Today I'm going to do Matthew's name on his wall in kind of a superhero/comic book font that will look nice with the Superhero theme in his bedroom. Then that got the bug in me to redo Josh's room, which is way overdo for it. When we moved here I painted both of the boys rooms in a light blue and then figured I'd do some more decorating later. We've now lived here for almost five years and I've never really decided how I want to do Josh's room. So I sat down with him and we picked out some really cool things. I'm not going to do it now because I want to get the rest of the adoption stuff out of the way first, but once Clarissa is here and settled, I'm going to get his room finished. Now that we've figured out what we want to do it's just a matter of painting and buying the bedding and decor we picked out. We decided to go for kind of a red, white and blue Americana theme. 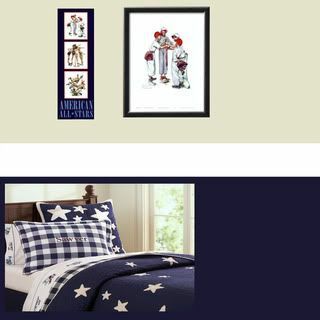 Pottery Barn has some star bedding that I LOVE and we picked some really cute Norman Rockwell sports themed posters for his wall that have a lot red, white and blue in them. I'll do his name in Red vinyl lettering and I can put some white vinyl stars on the wall. Here's our idea board, with the paint colors, samples of the artwork and the bedding. It's going to look really cute when it's finished! I'm really excited about getting that done! I'll post photos in a few months when I get it finished. So those are the exciting projects I have going on here these days! Now that our I600 form is done we estimate that we're about a month away from traveling to Korea! I can't believe how close we are!!! So these next few weeks are going to be busy while we get bags packed and finish up all Clarissa related projects. I need to buy diapers and baby gates and make sure she has enough clothes and go through the baby toys I have in storage and finish babyproofing the house and there are a million other things on my list. We got our I600 approval in the mail today!!! YAY!! That brings us one big step closer to Clarissa! We're now on the the next step, and I don't understand the details of it enough to explain it at the moment, but I'll read up on it today so that I understand what it entails. There's nothing we have to do, it's just waiting for another round of paperwork. I'll explain it better once I've had a chance to fully understand it. I have a TON more stuff to talk about, Josh got his cast on yesterday, I'm working on a big fun project for Clarissa's room and the rest of our house today and we've got lots going on, but I'm going to wait until later to post it. 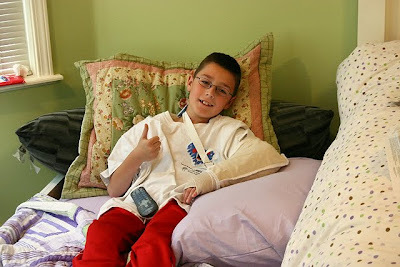 I'm going to take some pictures of Josh with his cool new cast, but my camera battery is charging at the moment. At the moment I'm going to go back to my project with a huge smile on my face! Having I600 approval is a gigantic load off my mind!! It seems like whenever there is some sort of chaotic event in our lives, it's immediately followed by several more. When it rains it pours around here and today it's pouring. Josh is at the doctor with Shawn right now getting a chest x-ray to rule out pneumonia. In the midst of the pain he's been in this week with his arm, he seems to have developed a cold. It started out as the sniffles and then a little cough, and then a BIG cough, and today he's been really wheezy and miserable. Shawn just called me from the doctors office and said that the doctor doesn't like the way his lungs sound so they're going to give him a breathing treatment and then they're going to do a chest x-ray. I've sort of reached the point this week where I'm so ridiculously stressed out that all I can do is sit here and take deep breaths and remind myself that surely it has to pass soon, right?? Poor Josh, it just breaks my heart that he's having such a hard time right now. The pain in his arm seems to be a lot better, but he doesn't feel well, he's bored, he's tired from not sleeping well with the cast on his arm and all the coughing he's doing and I think he's just had enough of it. I hope that he doesn't have pneumonia and that it's just a bad cold that will clear up on it's own soon. I guess worst case scenerio we head back over to the hospital and spend some more time with the nice people on the peds floor. I wonder if they offer a frequent visitor discount. So that's what's going on here today. We're all kind of cranky and exhausted and stressed out and life isn't all that fun here this week. Hopefully Shawn is going to call me back in a few minutes and say that everything is fine, Josh just needs some good cough medicine and that he'll be fine. I think Josh has been through enough for one week! UPDATE: It's not pneumonia, it's bronchitis. Still not fantastic, but I'm relieved that it's not pneumonia. The doctor gave him some medication and hopefully he'll be feeling better soon. It's been an exhausting few days around here! We got home from the hospital yesterday afternoon and after getting Josh comfortable on the couch we all pretty much crashed for the rest of the day. Josh is doing OK, but he's still having a lot of pain at times. I was concerned about where he should sleep last night because I wanted it to be somewhere super comfortable, but close to us so that I could help him in the night if he needed it. It turned out that the best place for him is Clarissa's room! It's right across the hall from us, so I can hear what's going on in there really well, plus with the trundle there are two beds in there so that I can stay in there with him if I need to. I pulled the trundle out and made him a perfect little cocoon with pillows so that he can elevate his arm comfortably and that is working out really well. Then I can sleep on the upper bed if I need to, or people can comfortably hang out in there with him. Matthew actually got up at about 10:30 and went and crawled into the upper bed and slept in there last night. I think he just wanted to be close to Josh, which was really sweet. I was planning to get him comfortable on the couch during the day, but he's so comfortable in Clarissa's room that he's pretty much just staying in there for now. He has to keep his arm bent, elevated and iced as much as possible, so there's no a whole lot he can do but lay there. I put a TV in there and we've all been in there entertaining him, so I think he's definitely not getting too bored. This morning he was really in a lot of pain, but as the day has gone on he seems to be doing better. We're keeping the pain medicine in him and that seems to be helping. Hopefully he'll improve every day and be doing a lot better soon. They have decided to do surgery on josh's arm in the morning. We're staying overnight. I'll update when I can. Update-elbow definitely broken. Waiting for ortho doc. Josh likes morphine. :) more to follow. At the ER with josh. I think his elbow is broken. More to follow. 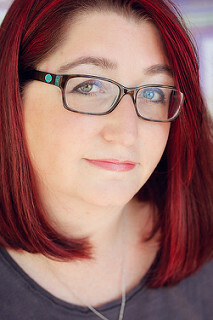 If you've been reading my blog lately you'll know that I was waiting to hear something. I heard something and I've been told not to discuss it so I've deleted the info from my blog. Some day I'll be able to tell the story, but not now. Everything is good and I hate being cryptic, but I don't want to jepordize anything. This blog has been kind of a ghost town lately! Life has been super hectic around here lately but none of it has been exciting enough to blog about. The kids are are getting settled in school and they seem to be adjusting well. They're making friends and they come home happy every day, so things seem to be working out. Although I did find out something mildly irritating yesterday! The whole reason we started thinking about switching them to the new school was because at the end of last school year we were told that their old school would no longer be bussing in our area. I was really stressed out about that because with Clarissa coming in a couple of months, bussing is going to be a huge help to me this school year. I stressed out over what to do about the bussing problem, we finally decided that this new school has enough pro's that switching would be a good idea and then I stressed out over whether or not they'd get in. Then yesterday I found out that the old school changed their mind and they ARE bussing in our area this year! And now we have to walk past their old, very convienent, bus stop to get to their new, not convienent at all, bus stop. Bleh. 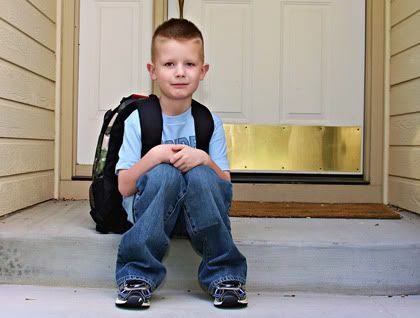 Oh well, the new school is good, the kids have lots of friends there and I think that things are going to work out just fine. The new school and the old school are extremely similar, but the new school has more friends from our church there. So I guess switching makes sense anyway. So once I finally got my kids off to school I got all ready to start tackling some projects around here...and then I got sick! I really haven't felt well for the past couple of days. I'm super tired and achy and my stomach is not happy with me if I eat anything. So I've kind of just been laying around stressing over the fact that I have things to do and I don't feel well enough to do them. But Matthews birthday is tomorrow and I have birthday stuff to do so this morning I dragged myself out and got all the birthday shopping done, so we're ready to celebrate tomorrow. We're not having a party with friends, but we're going to do something special as a family. I told Matthew that he could plan the day tomorrow. Whatever he wants to do is what we'll do. So maybe we'll go see a movie or go to the zoo or go to Chuck E Cheese or something. I'm sure that Matthew will come up with something fun. 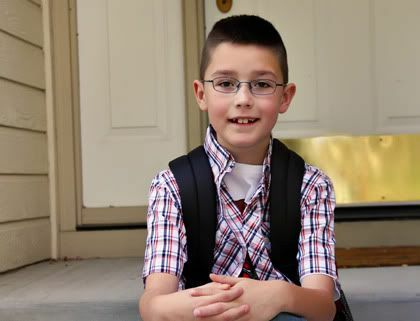 :) I can't believe he's going to be six already! Time is really flying by. In adoption news there's not a whole lot new. We got a call from the USCIS office yesterday letting us know that our fingerprint approval is done and that they received our I600 but haven't started working on it yet, but should be in the next few days. I was actually super impressed that they called. She even gave me a number to call her back if we have questions. Most USCIS offices aren't so friendly or accessable and won't allow you to call them directly. So I feel pretty good about the I600 process going smoothly. I hope that in a few weeks we're approved and on to the next step. So far our whole paperwork process has been really smooth and snag free and I'm really grateful for that. I've heard enough horror stories that I've been really worried about it. I'm kind of a nervous wreck these days anyway, so I've been really glad that the paperwork hasn't given me one more thing to stress about. I'm going to be SO glad when this is all over and we finally have Clarissa in our arms. I've lived and breathed this adoption for two years and now that we're in the home stretch I'm starting to burn out a bit. Not on thinking about Clarissa, of course, but just all the paperwork and the money and the logistics of getting her home. I'm just really anxious to move on from this and start the new and wonderful chapter in our lives. I look forward to the day when I can wake up in the morning and not just wonder what Clarisssa is doing but actually look over and see her sweet face. That sounds like Heaven to me! 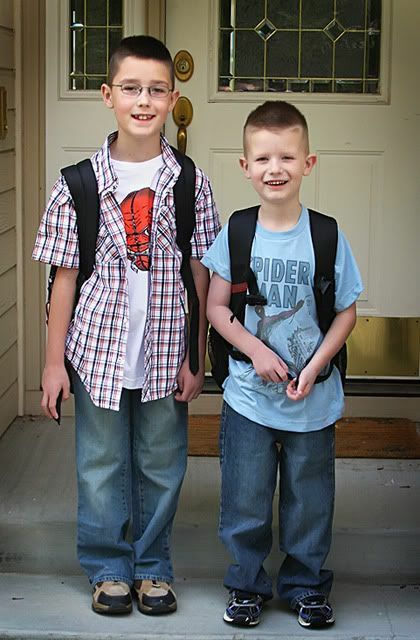 School starts in two days and I FINALLY got word this morning that both the boys got into the school they were on the waiting list for! YAY! I've been stressing over that for weeks, especially the closer we got to school starting. I haven't been able to buy school supplies or anything yet because I didn't know which schools supply list to use. So today I'll go over there and fill out all the registration papers and get them all set, tonight we'll be running around town on the great school supply hunt (I hate school supply lists), tomorrow we'll figure out bussing and lunches and all of that and hopefully on Wednesday morning I'll have them happily out the door on their way to school. So starting Wednesday I'm home alone! That's going to feel strange at first. I think it will be good because I'll be able to get a lot of things done, but it's going to be strange having the house so quiet all day. It will give me a chance to get the house ready for Clarissa though. I have a lot of work to do to get this house babyproofed before she gets here. Ususally when you have a baby you have several months before they're mobile, so you can kind of babyproof as you go along. But bringing home a baby who is already crawling and may even be walking before long is going to be a different story. Our house is big and there's lot of room for a crawling baby to roam. I've got some serious baby gate shopping to do. So that's what's going on around here these days. Right now I'm just focusing on getting through these next few hectic days getting ready for school and then I can go back to thinking about adoption projects again. I'm really looking forward to having Clarissa home and having all of this behind us. I feel like our lives have been on pause for a long time, just waiting for this adoption to happen and I'm looking forward to moving on to the next phase in our lives. I know that having Clarissa home will present us with a whole new set of challenges, but I think I'm ready for it. Bring it on. Today we got a big packet of papers in the mail from our adoption agency. I'm always super excited when I open my mailbox and see a big envelope from the agency! Today's package was a big packet of info about our trip to Korea. It pretty much covered every question we could possibly have about traveling to Korea to pick up Clarissa. In the middle of the packet were a few photos of the Korean agency where we'll go to get Clarissa and one photo was of the room where we'll most likely see our daughter for the first time. I took one look at that photo and started to get teary. This is actually going to happen. In a few months we're going to fly halfway across the world and sit on that very couch in that very room and meet our daughter for the first time. Thinking about that gives me butterflies in my stomach, tears in my eyes and a smile on my face. I'm SO nervous but SO excited! This is going to be an amazing journey. In the packet was information about how to choose a hotel, how to book plane tickets, what we need to pack for Clarissa, info about passports and immigration and currency exchange and Korean taxi's and so many more things that I think my mind is going to explode from all the information I processed today. This is actually happening!! This is an insane thing to say given how long we've waited, but I feel like everything is happening so fast! All of a sudden here we are reading information on how to book a flight and places to visit while we're in Korea and what to expect when we meet our daughter for the first time and I just can't believe that we're finally here! Clarissa only exsisted in my head for a very long time and in a few months she's actually going to be in my arms. We made it! Whew, today was a big day in adoption news!! First of all, we got Clarissa's six month well baby checkup report. She now weighs 20.5 pounds!! She's the chunkiest baby ever, lol. We also found out that she has two teeth!! She's getting so big! I was happy to read the report and hear that she's developing well, but a little sad that we're missing out on all her milestones. I can't wait to get her home. Which brings us to update #2! I got an e-mail today letting us know that we got Clarissa's emigration permit approval, which is one step in the paperwork process that I didn't expect to see for another few weeks at least! I usually see I600's approved before EP approval. What that means is that we're crusin' on the paperwork!! If things continue at this rate we may actually be travelling sooner than we thought, possibly in early October!! This is big news at our house today!! I'm praying that our I600 gets approved quickly because if it does we really may get Clarissa home a lot sooner than we thought. It's suddenly seeming very real!! After all this waiting we may actually be holding Clarissa in our arms in less than two months!! YAY!! So we're officially in August, which means another month has gone by and I haven't gone crazy yet, so that's good, right?! Let's see if I can say the same thing at the beginning of next month! So I'm sitting here looking over all the things I have going on this month and I'm hitting panic mode a little. Sometimes when I have so much to do it overwhelms me and I don't know where to start. At the moment I'm working on the monthly newsletter and calender that I do for my church job and that's stressing me out a bit. (actually, at the MOMENT I'm blogging in an attempt to ignore the things I'm supposed to be doing...) I have a whole bunch of things that have to be done for my church job at the beginning of each month and this month for some reason it's stressing me out a bit more than usual. Then it occured to me today that my kids start school again in 11 days. Normally I'm extremely organized about the beginning of the school year. I'm a big bargain shopper so normally I have school clothes shopping done way in advance, I have the school supply shopping underway by now and it's all fine. This year I'm not even a tiny bit prepared. I haven't bought school supplies, I haven't bought the kids any school clothes and actually at the moment I don't even know which school my kids are even going to! 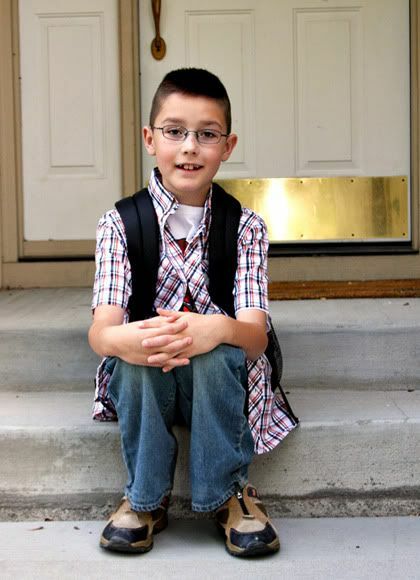 We're in the process of switching them to a new school this year (that story will require it's own post on a later date) and as far as I know right now Matthew is still on the waiting list, but I think that Josh got in, although I'm still not positive about that. I'm hoping that next week I can get someone from the school on the phone to tell me what's going on. 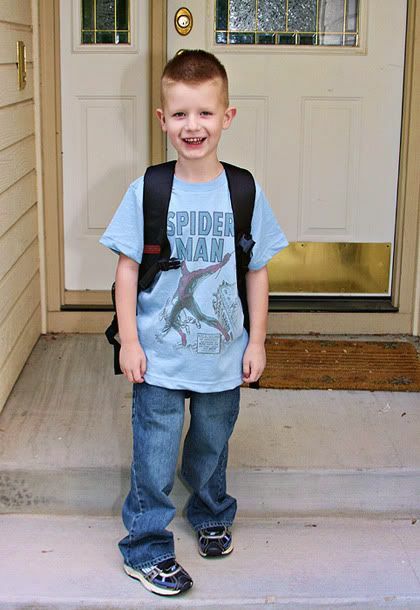 There's a possibility that my kids will be attending two different schools for a while if we can't get Matthew into the new school, and that's just really going to complicate my life. Then Matthew reminded me today that his birthday is in 15 days. I'm embarrassed to say that I haven't thought about a party or done any planning for that yet. It's on my list of things to do. I feel like a bad mom. I also somehow volunteered my backyard for a church party later this month and at the moment my yard, which I'm normally extremely picky about, is not exactly in party shape. My garden is growing nothing but weeds this year, my roses need pruning and it's not really a pretty sight back there right now. So I'm a little stressed about getting that ready in time. Plus at the moment I'm just consumed with the adoption. Honestly, my brain is in Korea right now and I think it's going to stay there until we finally go pick Clarissa up and we can FINALLY move on to the next phase in our lives. This adoption is so mentally exhausting right now. There's not a whole lot that physically needs to be done, I'm just constantly stressing over whether the is paperwork getting approved quickly, I'm wondering if they've done the medical test on Clarissa that we requested, I wonder if she's gotten her care package yet, I wonder how she's doing and if she's being loved and if she's happy and if she's developing OK...it's all on my mind 24/7. I'm also totally stressed about the finances of all of this. Between back to school stuff, Matthews birthday, saving for our trip and all the rest of it, I feel like the money is going out faster than it's coming in at the moment and that always stresses me out. It will all work out fine, it's not anything that won't resolve itself in time I just feel like I'm juggling more than I can handle at the moment with everything we have going on. I have to remind myself that I do this sometimes. I start making a mental list of every single thing I need to do and even though I don't need to do it all today, I start to panic that I'm not going to be able to get it all done. I WILL. I always do. We've been through crazy times before and it's all worked out and this will too. I know that, sometimes I just give into the meltdown for a bit. Ok, so now that I've written all that down, it's out of my head for a minute and I can back to working on my projects. One at a time, right?